Relaxation is essential to good health and well-being. Increased relaxation can improve sleep, improve health, and bring more joy, happiness, and peace of mind into our lives. There are a wide variety of ways to relax. We hope the resources on this site are helpful in assisting you in achieving deeper, more fulfilling states of relaxation. This Website is still **UNDER CONSTRUCTION** with a projected completion date of Summer 2014. Feel free to explore and use the resources already listed on the site. Additional Resources will be added in the near future. Ji Hye Jung Performs Serry's "Groundlines"
-- a practice involving prolonged voluntary laughter. Laughter yoga is based on the belief that voluntary laughter provides the same physiological and psychological benefits as spontaneous laughter. Laughter yoga is done in groups, with eye contact and playfulness between participants. Forced laughter soon turns into real and contagious laughter. Humor has been used in medicine throughout recorded history. One of the earliest mentions of the health benefits of humor is in the book of Proverbs in the Bible. As early as the thirteenth century, some surgeons used humor to distract patients from the pain of surgery. Humor was also widely used and studied by the medical community in the early twentieth century. Humor therapy is the use of humor for the relief of physical or emotional pain and stress. It is used as a complementary method to promote health and cope with illness. Laughter is easily stimulated in a group when combined with eye contact, 'childlike playfulness' and laughter exercises. Fake laughter quickly becomes real. Laughter Yoga brings more oxygen to the body and brain by incorporating yogic breathing which results in deep diaphragmatic breathing. Anyone can laugh without needing to rely on humor, jokes or comedy. Laughter is initially simulated as a physical exercise while maintaining eye contact with others in the group and promoting childlike playfulness. In most cases this soon leads to real and contagious laughter. 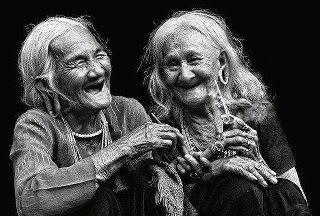 Laughter yoga is the only technique that allows adults to achieve sustained hearty laughter without involving cognitive thought. It bypasses the intellectual systems that normally act as a brake on natural laughter. Laughter yoga sessions start with gentle warm-up techniques which include stretching, chanting, clapping and body movement. These help break down inhibitions and develop feelings of 'childlike playfulness'. Breathing exercises are used to prepare the lungs for laughter, followed by a series of ‘laughter exercises’ that combine the method of acting and visualization techniques with playfulness. These exercises, when combined with the strong social dynamics of group behavior, lead to prolonged and hearty unconditional laughter. Laughter exercises are interspersed with breathing exercises. Twenty minutes of laughter is sufficient to develop full physiological benefits. A laughter yoga session may finish with "Laughter Meditation". This is a session of unstructured laughter whereby participants sit or lie down and allow natural laughter to flow from within "like a fountain"
A handful of small-scale scientific studies have indicated that Laughter Yoga may potentially have some medically beneficial effects, including benefits to cardiovascular health and mood. Benefits to mood in depressed patients have been found to be as good as exercise therapy. A study by Oxford University found that pain thresholds become "significantly higher" after laughter, compared to the control condition, and saw this as being due to laughter itself and rather than the mood of the subject. The study suggested that produced an "endorphin-mediated opiate effect" which could "play a crucial role in social bonding"
This section will contain clickable buttons for Featured Sponsors of the Week. Clicking on a Sponsor Buttons will display images and information from sponsor and links to the sponsor websites. 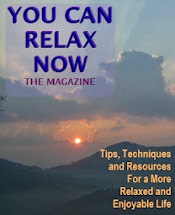 YOU CAN RELAX NOW is made possible by the generous donations of individuals and businesses who believe in the positive value of Relaxation for improved health and well-being. We encourage you to click on the sponsor names below to explore the products and services they have to offer.